It has been about a year since my last update on my Flamethrower Palm Tree 'Watermelon Form' ( Chambeyronia macrocarpa ). I purchased this Palm Tree March 2, 2008 at the F.I.T. Plant sale. I last updated it April 9, 2008. If you would like to read all of my posts on this particular Tree then CLICK HERE. My Flamethrower Palm Tree is doing great!! Here are some pictures for you to look at. This first picture is from my last update on April 9,2009. These next pictures were taken today August 17,2009. See the new shoot coming out. This last picture is of the base. I have also placed this nice ground cover in most of my pots now to prevent weeds from coming up. It has been pretty successful, although I don't have a name for it. If you know please inform me!! A while back I purchased a Red Latan Palm ( Latania lontaroides ). I finally put it in the ground yesterday. The Red Latan Palm can grow to heights of 40 feet tall. They also require cosistantly moist soil and full sun to grow at their best. It is a good idea to space them about 12 feet apart when planting multiples. The Red Latan Palm is native to the Mascaregne Islands which are 200kms from Mauritius. Here are some pictures of my new addition to the front yard. Notice the red edges hencing the name Red Latan Palm. They are very sharp too. Rainbow Gum Eucalyptus ( Eucalyptus deglupta ) Score!! When I took my trip to McKee Botanical Gardens in Vero Beach Florida I noticed a Tree in there parking lot. This Tree was unlike any I have ever seen before. This quickly made its way up my favorite tree list. 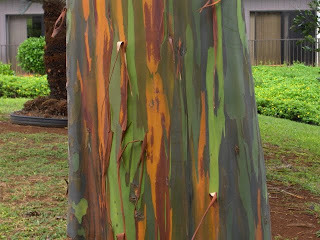 The name of this Tree is the Rainbow Gum Eucalyptus Tree ( Eucalyptus deglupta ) or the Mindanao Gum Tree. The bark of this fascinating Tree peels off in layers of the colors lime green, dark green, burgundy, brown, red, and orange. This gives off the effect that the Tree is camouflage. It is absolutely stunning!. The Rainbow Gum Eucalyptus Tree grows very tall reaching heights of well over 50 feet. I have heard that they can reach up to 200 feet tall in their native land of the Philippines. This beautiful Tree likes constantly moist soil and full sun. I just scored on a set of 4 Rainbow Gum Trees for $28.00. They are not to big but they will reach their height in a timely fashion. Here are some pictures of my Rainbow Gum Eucalyptus Score. This picture is of all 4 placed next to a 20 ounce water bottle for size comparison. This is an overhead shot of the leaves. This is a picture of one that I planted in a 1 gallon pot, with the 20 oz water bottle . These next 2 pictures are of the amazing bark. I googled these images to be able to show you what I'm talking about. 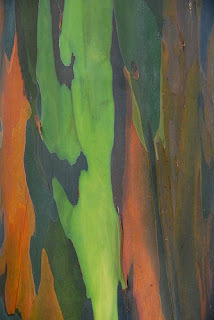 I hope you enjoyed my post on the beautiful Rainbow Gum Eucalyptus Tree. See you again next time!! Red Flower Royal Poinciana Update!! It time for an update on my baby Red Flower Royal Poinciana Tree (Delonix regia). If you want to read my previous posts on this tree then Click Here. I planted this tree April 25, 2009. That was almost 4 months ago. There has been substantial growth since then. Here are some pictures of my Red Flower Royal Poinciana Tree ( Delonix regia ). These first two shots are from last night. The leaves fold up at night and when it rains. The last three I took today. I hope you enjoyed the pictures. See you again next time! !